The invention relates to a double-effect leaching agent for trace uranium sample pretreatment. The double-effect leaching agent contains a fluorescent complexing agent, an eluent and a solvent, wherein the concentration of the fluorescent complexing agent is 0.04-0.1mol/L and the concentration of the eluent is 0.2-0.4mol/L. The double-effect leaching agent for trace uranium sample pretreatment provided by the invention can be used for effectively eluting uranium during a pretreatment process and also can act as a fluorescent reinforcing agent. A test proves that the recovery rate of uranium is stable after the double-effect leaching agent is used for treating the uranium samples in different concentration extents, so that the double-effect leaching agent provided by the invention is excellent in overall performance and is fit for batch analysis. 本发明属于铀萃取与分析技术领域，具体涉及用于痕量铀样品预处理的双效浸取剂。  The present invention belongs to the technical field of uranium extraction and analysis, particularly relates to double-effect lixiviant for trace uranium sample pretreatment. 痕量铀的分析是铀含量测定工作中的重要内容之一，如铀矿水冶中的尾矿和废液，铀转化中的尾料、尾气，后处理工艺的废液、废有机相，三废处理中净化水等物料中痕量铀的含量是工艺效率、产品回收率的反映，痕量铀的分析贯穿整个核燃料循环的各个环节。 Determination of Uranium Analysis  is an important determination of the uranium content of the work, such as uranium tailings HYDROMETALLURGY and waste, the conversion of uranium tailings, exhaust gas, waste liquid treatment process, the waste Determination of uranium content of the organic phase, purified waste water treatment material is the process efficiency, product recovery reflection analysis of trace uranium throughout each link in the nuclear fuel cycle. 环境样品中水、土壤的铀含量均属于痕量铀范围，痕量铀的分析作为日常分析项目，特别是稀土矿、核设施周边等的环境监测，每天都有大量样品需要进行痕量铀分析。 Environmental samples of water, the uranium content of the soil belong to the range of trace uranium analysis of trace amounts of uranium as a daily analysis of the project, especially rare earth mine, nuclear facilities and other surrounding environmental monitoring, every day a large number of samples required for trace analysis of uranium . 因此建立简便快捷的痕量铀分析方法具有重要的实际意义。 It has important practical significance to establish simple and efficient method of trace uranium analysis. 目前用于浓度为10 6~10 9g/mL痕量铀的测定方法主要有质谱法和时间分辨荧光法。  It is used at a concentration of 10 6 ~ 10 9g / mL Determination of trace uranium mainly mass spectrometry and time-resolved fluorescence. 时间分辨荧光法测痕量铀，选择性好、灵敏度高（10 ng/mL)，而且时间分辨荧光仪体积小巧价格便宜，对实验条件要求低，易于密封在手套箱中使用，因此应用十分广泛。 Time resolved fluorescence measurement of trace uranium, good selectivity, high sensitivity (10 ng / mL), and time-resolved fluorescence meter compact inexpensive low experimental conditions require easy to use sealed in a glove box, and therefore is widely used . ①铀分析仪配套出售的荧光增强剂中除含有荧光增强作用的试剂外，还含有pH 缓冲试剂、掩蔽剂等多种成分，其配方因商用而保密。  ① fluorescence analyzer Kitting uranium enhancers in addition to containing a fluorescent agent to enhance the effect, but also contain pH buffering agents, masking agents and the like more components and their formulations because of commercial confidentiality. 申请人在长期工作中发现，同批次荧光增强剂制得的标准样品绘制出的工作曲线线性良好，但是不同批次荧光增强剂制得的标准样品绘制出的工作曲线斜率有明显差异，说明使用不同批次荧光增强剂铀的回收率不同，荧光增强剂在关键参数的控制要求与浸取剂不同，其中某个（些）非重点控制参数对于铀的浸取率影响较大。 Applicants found that long-term work, the same batch of fluorescence intensity enhancing agent prepared standard sample plotted curve good linearity, but different batches of fluorescence intensity enhancing agent prepared standard sample plotted curve slopes were significantly different, indicating that different recoveries using different batches of uranium fluorescence enhancers, enhancer fluorescence key parameters required to control the different leaching agents, wherein the one (s) of non-key control parameter for the greater impact of leaching uranium. ②按照铀分析仪的标配方法，检测每个分析样品时荧光增强剂的使用量为0. 5mL， 若将荧光增强剂作为痕量铀预处理方法中的浸取剂使用，则处理并检测每个样品时荧光增强剂的使用量为10mL，其用量增加了20倍。  ② A method in accordance with standard uranium analyzer, detecting the amount of each sample was analyzed using the fluorescence intensity enhancing agent is 0. 5mL, pretreatment methods trace uranium leaching agent as if the fluorescence intensity enhancing agent, then each sample processing and detecting fluorescence intensity enhancing agent is used in an amount 10mL, an amount 20-fold increase. 市售荧光增强剂价格贵（IOmL市场价为12元）， 对于批量样品分析来说，使用成本高，不利于方法的推广使用。 Commercial optical enhancer expensive (IOmL market price of $ 12), for bulk sample analysis, the use of high cost, is not conducive to promoting the use of the method. 针对现有技术中存在的缺陷，本发明的目的是提供一种用于痕量铀样品预处理的双效浸取剂，采用该双效浸取剂既能在预处理时有效洗脱铀，又能够在检测时起到荧光增强剂的作用，且不同浓度区间内铀的回收率稳定。  the defects in the prior art, the object of the present invention is to provide a dual effect lixiviant for trace uranium sample pretreatment, the use of the double-effect lixiviant can effectively wash pretreatment removal of uranium, but also can play a role in enhancing fluorescence detection and recovery of the uranium concentration range of different stabilizers. 为达到以上目的，本发明采用的技术方案是：用于痕量铀样品预处理的双效浸取剂，所述双效萃取剂包含荧光络合剂、洗脱剂和溶剂，其中荧光络合剂的浓度为0. 04-0. lmol/L，洗脱剂的浓度为0. 2-0. 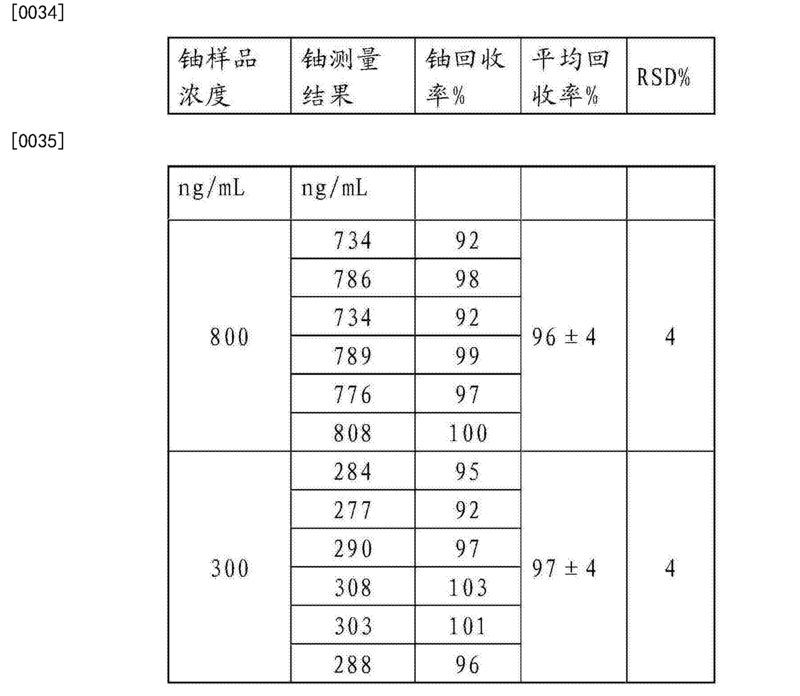 4mol/L ;所述双效萃取剂的pH值为7-8。  To achieve the above object, the technical solution of the present invention is that: for pre-treatment of the sample trace uranium leaching effect agent, said two-way extractant comprises a fluorescent complexing agents, solvents and eluents, wherein concentration of the fluorescent ligand is 0. 04-0 lmol / L, the concentration of the eluent is 0. 2-0 4mol / L;.. pH of said two-way extractant is 7-8. 本发明的双效浸取剂用于痕量铀样品预处理时，其作用原理是：①荧光络合剂与铀酰离子可形成荧光络合物，达到荧光增强效果；②洗脱剂，以竞争吸附的方式将离子交换纤维上吸附的铀洗脱，达到洗脱效果。  When the double-effect agent of the present invention, leaching of uranium traces for sample pretreatment, its mechanism are: ① a fluorescent uranyl ion with a complexing agent forming a fluorescent complex, to enhance the fluorescence effect; ② elution agents, competitive adsorption manner adsorbed on ion exchange fibers uranium elution, to effect elution. 进一步，所述荧光络合剂为可溶于水的焦磷酸盐、硫酸盐或磷酸盐；所述洗脱剂为可溶于水的磷酸盐、盐酸盐或碳酸盐。  Further, the fluorescent complexing agent is a water-soluble pyrophosphate, sulfates or phosphates; eluent said water-soluble phosphates, carbonates, or hydrochloride salt. 进一步，焦磷酸盐为Na4P2OjP /或K 4P207。  Further, pyrophosphate is Na4P2OjP / or K 4P207. 进一步，磷酸盐选自NaH2P04、KH2P04、NH4H 2P04、Na2HP04、K2HP0 4、（NH4) 2HP04、Na3P04、 K3PO4、（NH4) 3P04中的一种或多种。  Further, a phosphate selected NaH2P04, KH2P04, NH4H 2P04, Na2HP04, K2HP0 4, (NH4) 2HP04, Na3P04, K3PO4, (NH4) one or more of the 3P04. 进一步，在配制双效浸取剂时，采用硝酸调节pH值为7-8。  Further, in the preparation of the double-effect lixiviant, nitric acid and adjusting pH to 7-8. 优选情况下，可采用硝酸调节pH值为7. 5。 Preferably, the nitric acid can be adjusted to pH 7.5. 本发明提供的用于痕量铀样品预处理的双效浸取剂，既能在预处理时有效洗脱铀，又能够在检测时起到荧光增强剂的作用，试验表明，对不同浓度区间内的铀样品，采用该双效浸取剂处理后，铀回收率稳定，即本发明的双效浸取剂的综合性能良好，适用于批量分析。  The present invention provides a double effect of trace uranium leaching agent is used for sample pretreatment, can effectively elute the uranium in the pretreatment, but also can play a role in enhancing fluorescence detection, test show that for after concentration of uranium in different sample interval, using the double-effect leaching agent treatment, recovery of uranium stability, i.e., good overall performance lixiviant double effect of the present invention, suitable for batch analysis. 图1是浓度在lOO-lOOOng/mL的铀标准溶液采用本发明实施例1的双效浸取剂处理后使用微量铀分析仪测量的荧光强度Fx与铀浓度C x的工作曲线。  FIG. 1 is a concentration of the working curve using a micropipette after double effect lixiviant Example 1 reprocessed uranium analyzer measures the fluorescence intensity Fx and uranium concentration C x of the embodiment of the present invention lOO-lOOOng / Uranium standard solutions mL. 下面结合具体实施方式对本发明作进一步描述。  DETAILED DESCRIPTION The following embodiments of the present invention will be further described. 双效萃取剂配方：Na4P2O7浓度0. 04mol/L，K 2即04浓度0. 35mol/L，以硝酸调节pH 值为7. 5。  Extraction of double-effect agent formula: Na4P2O7 concentration of 0. 04mol / L, K concentration i.e. 04 2 0. 35mol / L, nitric acid to adjust the pH to 7.5. 双效萃取剂配方：Na4P2Or^度(λ 08mol/L，Na 2ΗΡ04浓度(λ 2mol/L以硝酸调节pH 值为8。  Extraction of double-effect agent formula: Na4P2Or ^ degrees (λ 08mol / L, Na 2ΗΡ04 concentration (λ 2mol / L nitric acid to adjust the pH to 8. 双效萃取剂配方：K4P2O7浓度0. lmol/L，（NH4) 2ΗΡ044浓度0. 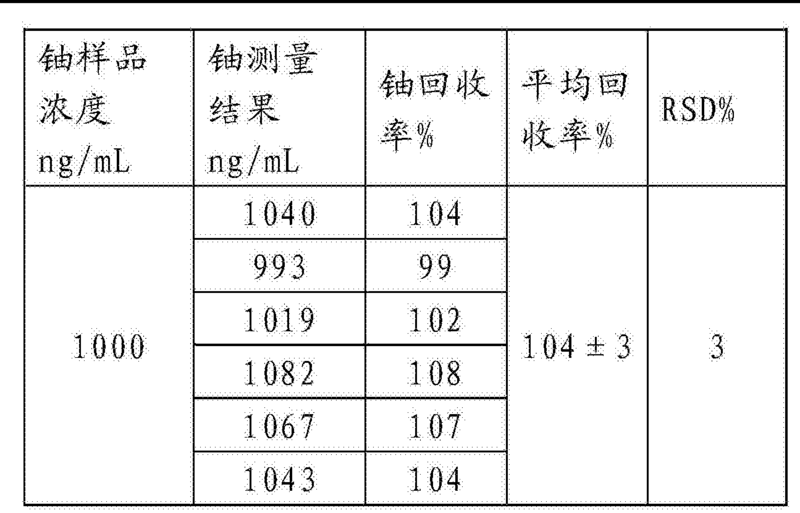 4mol/L，以硝酸调节pH 值为8。  Extraction of double-effect agent formula: K4P2O7 concentration of 0. lmol / L, (NH4) 2ΗΡ044 concentration of 0. 4mol / L, adjusted to pH 8 with nitric acid. 双效萃取剂配方：K4P2O7浓度0. 04mol/L，KH 2P04浓度0. 2mol/L，以硝酸调节pH值为7。  Extraction of double-effect agent formula: K4P2O7 concentration of 0. 04mol / L, KH 2P04 concentration 0. 2mol / L, adjusted to pH 7 with nitric acid. 以下以实施例中较优配比的双效萃取剂为例说明本发明的效果。  In the following embodiment double effect extractant ratio Jiaoyou an example embodiment of the present invention effects. 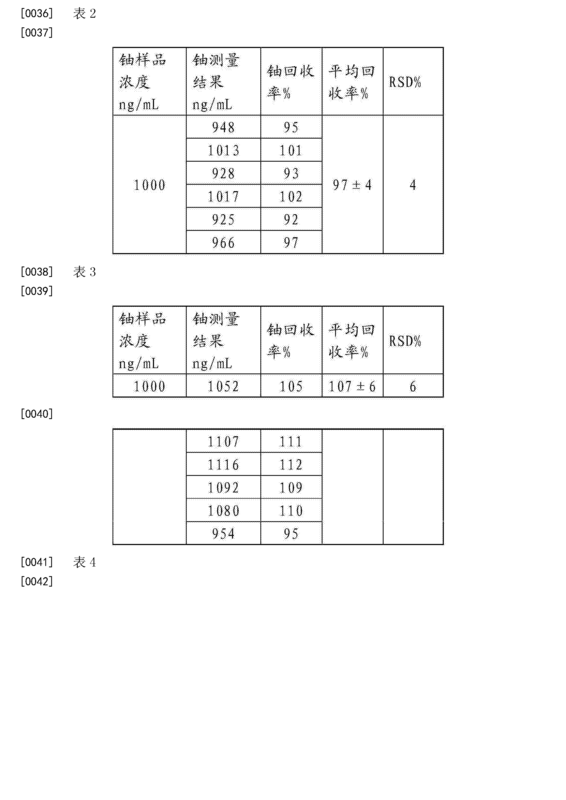 取一系列浓度(；为100~1000ng/mL的铀标准溶液各0. lmL，使用实施例1的双效萃取剂，采用专利ZL201110358170中的方法进行预处理，处理结束后，直接取5mL使用微量铀分析仪测量荧光强度Fx。根据F3r^Cx的关系绘制标准工作曲线，见图1。  take a range of concentrations (; of 100 ~ 1000ng / mL standard solution of each of uranium 0. lmL, the use of double-effect agent of Example 1 was extracted using the method of Patent ZL201110358170 pretreatment, after the processing, direct access 5mL uranium analyzer using a microplate fluorescence intensity was measured Fx. draw standard curve based on the relationship F3r ^ Cx, shown in Figure 1. 从图1上看，？  From the point of view Figure 1,? ；!与（：：!呈线性关系$：!=5.218(： ：!+387.0，1? = 0.997)，这反映了预处理的稳定性。 ; And (:: linear $:!!! = 5.218 (:: + 387.0,1 = 0.997), reflecting the stability of the pretreatment!?. 使用其他实施例的双效萃取剂对铀标准溶液进行预处理，所测得荧光强度Fx与浓度Cx也呈线性关系，只是采用不同配方的双效萃取剂所得到的工作曲线略有差异，此处不再一一赘述。  The use of double-effect of other embodiment of the extractant solution was pretreated standard uranium, the measured fluorescence intensity with concentration Cx Fx also linear, but with different formulations of double-effect extractant obtained working curve slightly the difference here is not detailed. 选择约300ng/mL、800ng/mL两个浓度的铀溶液，分别使用实施例1、2、3、4的双效萃取剂进行回收率稳定性实验，每个实验分别取6个平行样，根据相应的工作曲线，得到测量结果，分别见表1、2、3、4。  selected from about 300ng / mL, both concentrations of 800ng / mL uranium solution, respectively, using the extractant embodiment double effect recoveries embodiment 1,2,3,4 stability experiments, each experiment were collected 6 parallel like, depending on the respective operating curve, the measurement results obtained, are shown in Table 1,2,3,4. 表1-4的实验结果表明，采用本发明提供的双效浸取剂处理铀样品铀的回收率稳定，说明研制的双效浸取剂综合性能良好，完全满足应用要求。 Experimental Results  Tables 1 to 4 show that the double-effect lixiviant recovery process of the present invention provides a stable uranium of uranium samples, indicating a good development of the double-effect overall performance lixiviant, fully meet the application requirements. 上述实施例只是对本发明的举例说明，本发明也可以以其它的特定方式或其它的特定形式实施，而不偏离本发明的要旨或本质特征。  Examples of the above-mentioned embodiments of the present invention will be described, the present invention may be embodied in other specific ways or in other specific forms without departing from the spirit or essential characteristics of the invention. 因此，描述的实施方式从任何方面来看均应视为说明性而非限定性的。 Thus, any of the described embodiments should be regarded as illustrative rather than in terms of limiting. 本发明的范围应由附加的权利要求说明，任何与权利要求的意图和范围等效的变化也应包含在本发明的范围内。 The scope of the invention should be described in the appended claims, the intent and scope of any claims and equivalent modifications should also be included within the scope of the present invention. 2. 根据权利要求1所述的用于痕量铀样品预处理的双效浸取剂，其特征在于，所述荧光络合剂为可溶于水的焦磷酸盐、硫酸盐或磷酸盐；所述洗脱剂为可溶于水的磷酸盐、盐酸盐或碳酸盐。 The sample pretreatment for trace uranium leaching double-effect agent according to claim 1, wherein said complexing agent is a fluorescent water-soluble pyrophosphate, sulfate or phosphate; the eluent is a water-soluble phosphates, carbonates, or hydrochloride salt. 3. 根据权利要求2所述的用于痕量铀样品预处理的双效浸取剂，其特征在于，所述荧光络合剂为可溶于水的焦磷酸盐；所述洗脱剂为可溶于水的磷酸盐；所述双效萃取剂的PH 值为7-8。 The double effect of trace uranium leaching agent is used in the sample preparation as claimed in claim 2, wherein said complexing agent is a fluorescent water-soluble pyrophosphate; the eluent water-soluble phosphate; said two-way extractant the PH value of 7-8. 4. 根据权利要求2或3所述的用于痕量铀样品预处理的双效浸取剂，其特征在于，焦磷酸盐为Na4P2OjP/ 或P207。 The sample pretreatment for trace uranium leaching double-effect agent of claim 2 or claim 3, wherein the pyrophosphate is Na4P2OjP / or P207. 5. 根据权利要求4所述的用于痕量铀样品预处理的双效浸取剂，其特征在于，磷酸盐选自NaH2P04、KH2P04、NH4H2P04、Na2HP04、K2HP04、（NH4) 2HP04、Na3P04、K3P04、（NH4)孑04中的一种或多种。 According to claim trace uranium sample pretreatment double effect lixiviant 4, characterized in that the phosphate is selected from NaH2P04, KH2P04, NH4H2P04, Na2HP04, K2HP04, (NH4) 2HP04, Na3P04, K3P04 , (NH4) one or more of 04 larvae. 6. 根据权利要求3所述的用于痕量铀样品预处理的双效浸取剂，其特征在于，在配制双效浸取剂时，采用硝酸调节pH值为7-8。 According to claim trace uranium sample pretreatment double effect lixiviant claim 3, wherein, in the preparation of the double-effect lixiviant, nitric acid and adjusting pH to 7-8.